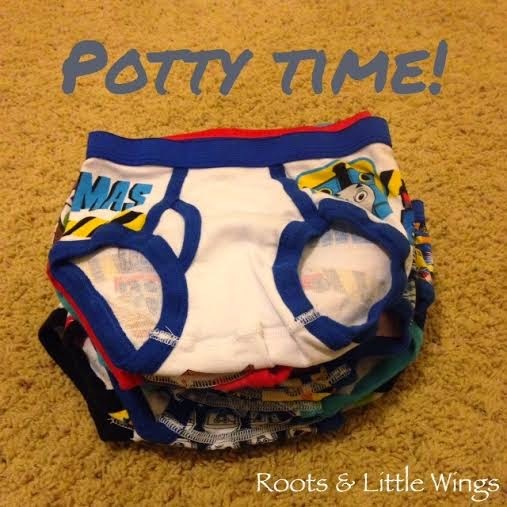 Roots & Little Wings: Potty Time! Yes indeed, it is "Potty Time" at our house! Noah wears his big kid underwear all the time now (except for sleep) and loves his little potty. It is has been over a week now since we potty trained, and he has had only 1 accident. We are so proud of him, but more importantly, Noah is so proud of himself! :) **Note: This is a long post primarily because I want to remember how we potty trained Noah for any future kiddos. This method worked so well for him, so I don't want to forget how we did it! We first got Noah a little potty when he was about 18 months old. We bought the small Baby Bjorn stand alone potty. He was very excited when we first got it, and he liked to sit on it with and without his clothes on. He sometimes would pee in it before bath, but that was about it. So, at that point, we just kept the potty in his bathroom for him to use whenever he was ready. It basically sat there for over 6 months with very little use. About 1 month ago, Noah started showing signs again that he was interested in using the potty. He started telling me when he had to go poop in his diaper, and he began wanting his privacy during this time. He also started verbalizing where pee pee comes out of and where poo poo comes out of. It was quite comical! In addition, he started pulling his diaper off during diaper changes and helping pull his pants off. I thought I would go with it to see if he was ready to fully potty train. For about a week, I started motivating him to use his little potty once again by giving him dried coconut every time he tried to use the potty (this kid LOVES dried coconut!). I also let him watch the Daniel Tiger potty episode on YouTube several times during this week and found a fun "It's Potty Time" song for him to listen to. He still sings the catchy potty song from Daniel Tiger on a daily basis. He wanted to sit on his potty all the time. However, he wasn't peeing or pooping in it much, just sitting on it reading a book, watching a video, etc. I realized that he really didn't know what the urge felt like when he needed to use the bathroom at this point, so this lead me to try the 3 day potty training crash course with him the following weekend. I did do a good bit of research and talked to several other moms who had already potty trained before we started the 3 days to help me get ready. I am so glad I did because so much more went into the 3 day training than I would have imagined. I made him a sticker chart, potty bag full of inexpensive prizes and refilled his potty jar with dried coconut. Yes, this method involved LOTS of positive reinforcement. On a normal basis, I try to be mindful of how much external positive reinforcement and praise I give to Noah. I believe too much of it can be detrimental to the development of self and cause children to only be motivated by it. Something we do not want for Noah. However, with all of this being said, I feel like when used appropriately, positive reinforcement/praise can be a great thing. Potty training was one of those times I felt it would be a good idea to use it and LOTS of it as you can see! ;) Noah was so excited! I also planned several fun "at home" activities since we would be spending 3 entire days at home (with the exception of our Halloween get together since it was Halloween weekend when we potty trained). Thanks to a dear friend, I also had a detailed outline of how to potty train using this 3 day method on hand to keep myself on track with using only positive language and what steps to follow. This method made potty training extremely fun and positive and provided Noah with 3 days of full focused attention. He had a blast during the 3 days! There was nothing negative about potty training using this method. Even if he had an accident, I told him very calmly and positively that it was ok and just to remember to tell momma sooner next time when he needed to go pee pee or poo poo. He was also in control of when he went to the potty. I never forced him to use it. I simply told him: "Let Momma know if you need to go pee pee or poo poo." I literally asked him this all day long. He also wore big kid underwear from day one which helped teach him to stay dry. I also felt like I asked him all day long if his underwear was still dry. I believe these were the biggest factors that made potty training so successful for Noah. He totally got the hang of it after only 1.5 days, but we continued with the entire 3 days to make sure he had it down fully. He absolutely loved potty training and still feels so proud of himself every time he uses the potty. I would highly recommend this method to other people! -I made sure I was ready for the day before we started potty training (teeth brushed, make up on, dressed, etc). -We had breakfast together, and then we took off his "sleepy pants" (pull up). He still wears his pull ups for sleep since I do not feel he is quite ready for nighttime training yet. -Then, we would put on his big kid underwear and a long sleeve shirt only and start. -I would remind him to tell me whenever he had to go pee pee or poo poo, and I constantly asked him if his underwear was dry. -If he kept his underwear dry, we gave him lots of praise. -If he peed in the potty, we did a potty dance, he got a piece of coconut, and he got to put a sticker on his "potty track" sticker chart. -In between all of this, we offered him lots of liquids to encourage him to use the potty more frequently and we played at the house (both inside and outside). I stayed with him pretty much the entire 3 days in order to catch when he needed to go to the potty (this was a big part of the method). He did still nap solo in his crib and went to bed for the night solo, so sleep was not affected using this method. *There are more details do this method, but this was the main part of it. 3 days without seeing his favorite pal, Emma! So, what does life look like now that he is potty trained? Well, he wears big kid underwear all day long, and a little potty goes with us EVERYWHERE. I keep one of the small Baby Bjorn stand alone potties in the trunk of my car and a portable toilet travel seat in my backpack/diaper bag. I still ask him quite frequently if he is dry and if he needs to take a "potty break". He is now starting to come to me when he needs to use the potty without a reminder which is so great! He is also starting to use regular toilets with his little red potty travel seat on top when we are out and about and using his little potty in the car is not available. We are also learning the art form of patience when we have to wait in line to use a public bathroom. ;) I always have extra clothes and underwear in the car, as well as wipes, plastic bags, Burts Bees hand sanitizer and paper towels. His car seat is lined at the bottom with a garbage bag and small towel in case he has an accident (a little trick from another mom!). The only down side of potty training I have come up with so far is the "time"…the time that it took to get ready for the potty training weekend…taking the time to spend 3 days at home...and now the extra time that it takes to get out of the house and take "potty breaks". Potty training was a lot of hard work for all parties involved, but it ended up being a lot of fun and having HUGE pay offs! I would highly recommend the 3 day potty training crash course. Happy Potty Training!